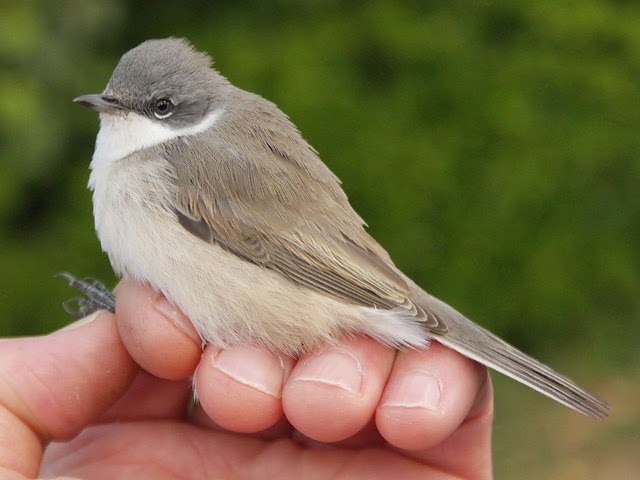 A relatively low key end to the month saw some decent passage overhead but not too much by way of numbers on the ground, with the best of the quality coming in the form of the putative Siberian Lesser Whitethroat lingering on at the Bill, an Osprey south there and a Jay (or two?) overhead both there and at Weston. Overhead it was very much a case of alba wagtails coming to the fore, with at least 600 through at the Bill, where Chaffinches also continued to increase (30 today), Skylarks featured for the first time (20), hirundines were more or less ubiquitous and 2 Merlins headed through. It was considerably quieter on the ground, where singles of Turtle Dove at Coombefield Quarry and Firecrest at the Bill were of note amongst the lowish numbers of routine migrants. The first Great Northern Diver of the autumn passed through off the Bill. A Golden Twin-spot (the 4th Portland record) caught overnight at Sweethill was by far the highlight of an otherwise disappointing night for immigrant moths; also late news for yesterday from there of a Deep-brown Dart (also c4th island record). 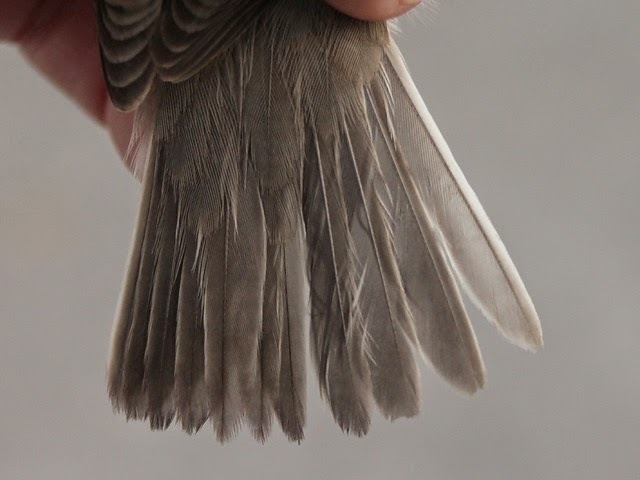 ...we won't bore readers with the full details of the confusing saga of this individual save to say that when retrapped today it turned out to be the individual first handled on 22nd September, and as such was a bird that we were already in the process of attempting to reconcile the in-hand features with what we eventually hope to learn from a feather sample. 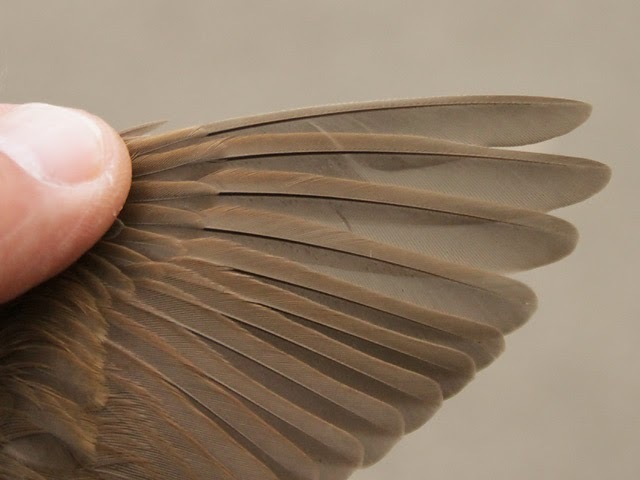 We're not quite sure why we've come in for online abuse regarding this bird when all we were trying to do was learn a bit more about the brownish-toned individuals that account for the vast majority of late LWT records at Portland, but the gist of it seems to be that according to some people they're so straightforward to do from field views that we may as well not be bothering. In more very pleasant birding conditions the day's scarcer migrants proved to be very difficult to catch up with, to the extent that the only one that made landfall - a Yellow-browed Warbler at the Obs - was only heard calling, whilst the others at the Bill - 2 Woodlarks, a Mistle Thrush and a Lapland Bunting - were all fly-overs. 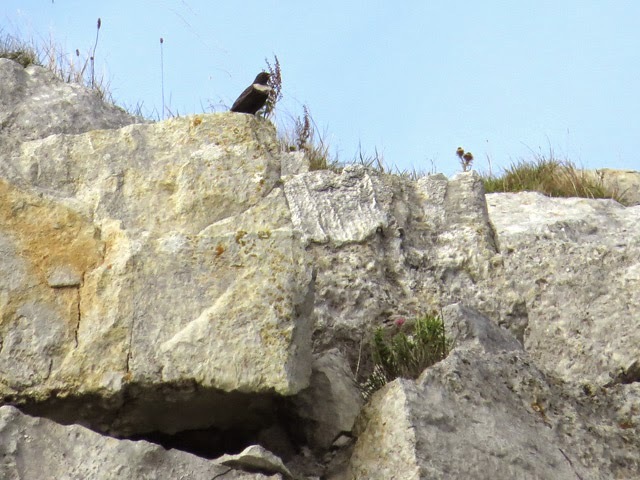 Predictably visible in the oddity line were both the Hooded Crow at the Grove and the Black Guillemot in Portland Harbour, whilst interest in the long-staying Lesser Whitethroat at the Obs Quarry that is thought to show features of blythi increased once it appeared to be established from part of its ring number read from photographs that it hadn't been ringed at the Obs and so wasn't necessarily a locally-bred bird. Routine migration continued in a rather similar vein to recent days, with Meadow Pipits and hirundines dominating overhead and Robins, Wheatears, Blackcaps, Chiffchaffs, Goldcrests and Linnets making up the bulk of the numbers on the ground, where there was an overall increase on yesterday; Song Thrushes were again a feature, particularly right at dawn, whilst less frequent migrants included a Hobby at Barleycrates Lane and a Merlin at the Bill. There was a very modest increase in immigrant moth numbers, with 18 Rusty-dot Pearl, a Rush Veneer and a Delicate at the Obs, whilst another Vagrant Twitcher Tebenna micalis was the best of the catch at Sweethill. Not a lot changing today with the samey conditions coming up with a samey selection of birds. 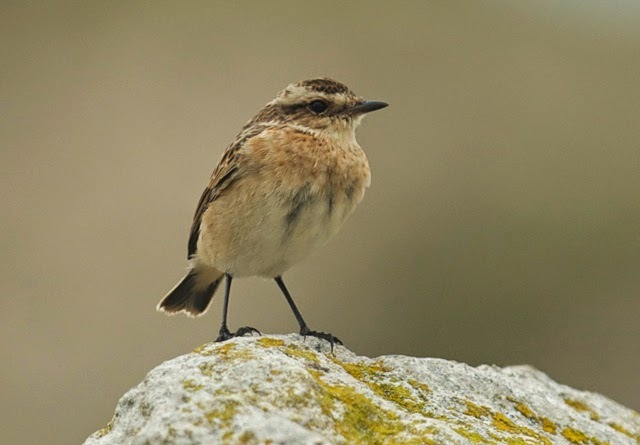 Rarity-wise, both the Wryneck and Barred Warbler remained at the Bill although both were extremely elusive and missed by most visitors, whilst the two long-stayers - the Hooded Crow at the Grove and the Black Guillemot - were also still in situ; both of the day's new oddities - a Dotterel at the Bill and Coombefield Quarry and a Tree Sparrow at the Bill - were fly-overs which weren't located again. Migrant-wise, it was conspicuously quieter both on the ground and overhead: Swallows and House Martins got well into four figures over the Bill, but Meadow Pipits only managed an c500 total there and Chiffchaffs were down to c70; the also-rans encompassed a wide selection of mid-autumn fare and, somewhat incongruously given the unseasonably warm conditions, indications at the Bill in the form of a Woodcock, an increase in Song Thrushes and the first double figure total of Chaffinches that the later autumn species are beginning to get going. 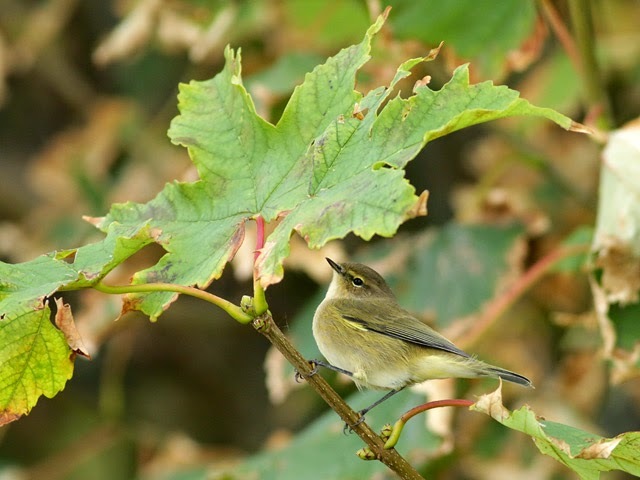 An enjoyably birdy day played out in still, muggy conditions and under an enticingly overcast sky; there was a feel all day of there being birds everywhere, with the trees busy with Chiffchaffs in particular, and the sky seemingly constantly full of Meadow Pipits and hirundines - autumn at its best. The south of the island got the best of the coverage, with highlights being a Barred Warbler in the Obs Quarry/hut fields area (we almost wonder if it could be the individual reported from the same area over a week ago), yesterday's Wryneck showing up again the Crown Estate Field (where it was trapped and ringed) and a Yellow-browed Warbler heard calling at Avalanche Road; elsewhere, the Black Guillemot remained in the Portland Harbour. 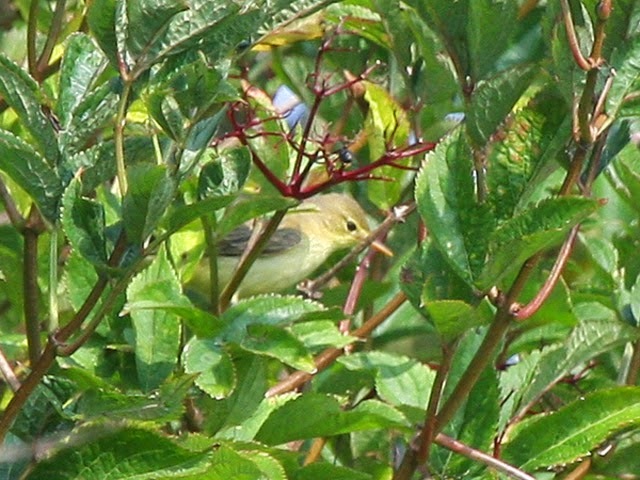 The apparently random movements of the alba wagtails, pipits and hirundines overhead dominated the numbers, but on the ground it was Chiffchaffs that were most conspicuous, with 200 at the Bill alone; the build up of off-passage Linnets there got into the low hundreds, whilst the varied list of lower totals included pretty well everything that might be expected in late September. The second Vagrant Twitcher Tebenna micalis of the autumn - like the first, at Sweethill - was the pick of the overnight moth catch; the limited number/variety of other immigrants included nothing better than single Delicates at the Obs and Avalanche Road. Few signs of passage picking up today with the spits and spots of rain soon after dawn dropping precious little in the way of new arrivals. 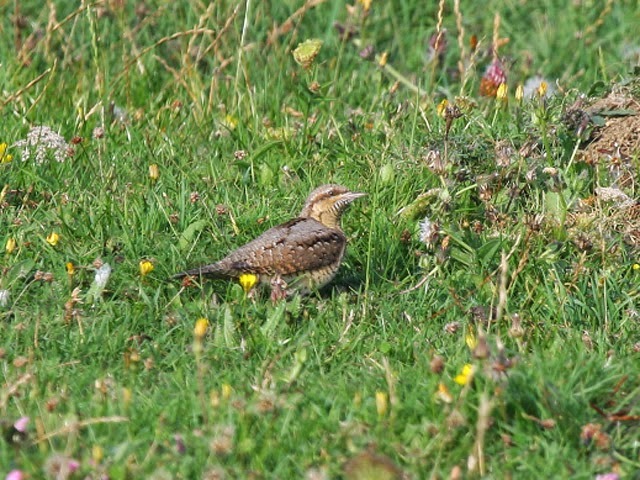 A Wryneck flushed a couple of times from dense cover in the Crown Estate Field was thought most likely to be the Privet Hedge/Culverwell individual from earlier in the week, whilst the fact that the next best bird making the list was a lone Balearic Shearwater passing the Bill was a sad but accurate reflection on the poor quality of the day's events. 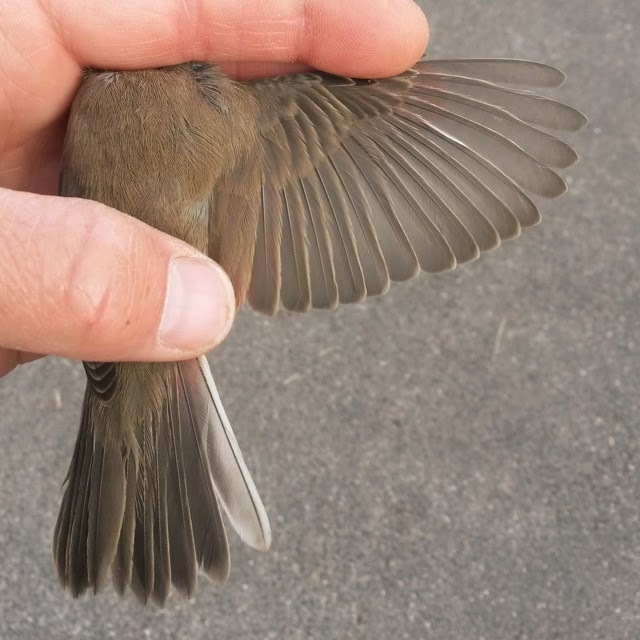 Most areas of cover hosted a handful of Blackcaps, Chiffchaffs and Goldcrests, but further variety at the Bill included nothing much better than 2 Whinchats and singles of Common Sandpiper, Garden Warbler and Lesser Whitethroat. Two Rusty-dot Pearl, a Rush Veneer and a Pearly Underwing were the only immigrants caught overnight in the Obs garden moth-traps. 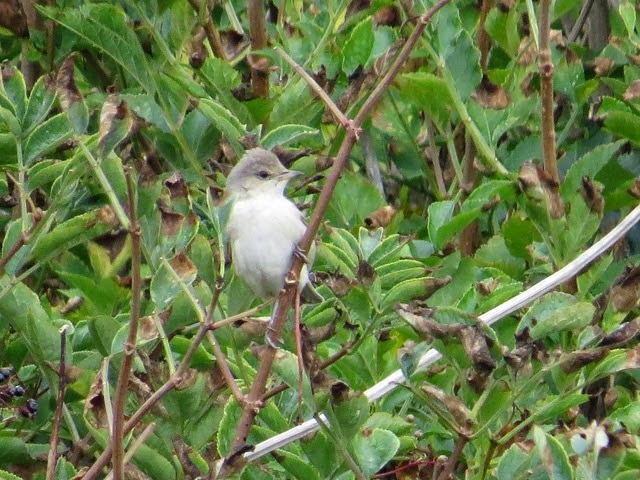 A day with a rather sad lack of variety and, 150 Chiffchaffs at the Bill aside, none too impressive numbers. 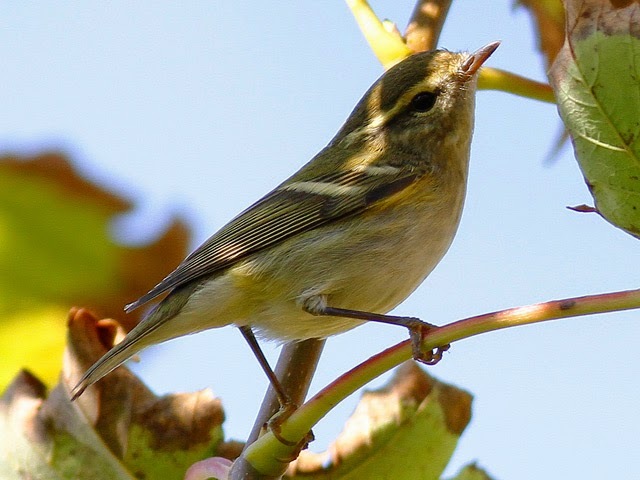 Another Yellow-browed Warbler, this time at Reap Lane, provided the only scarce migrant interest, with precious little in the way of even less frequent species bar a lone Firecrest at Avalanche Road. The Chiffchaffs certainly dominated on the ground, with few other arrivals except for the ubiquitous Meadow Pipits even managing a double figure total at the Bill. 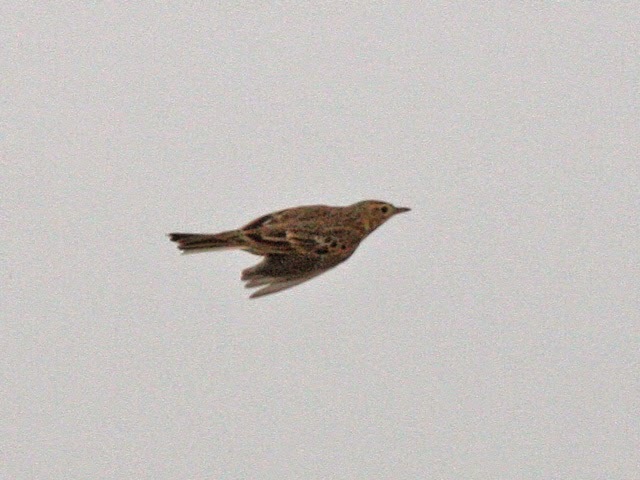 Meadow Pipits also made up the lion's share of overhead passage, with 500 through over the Bill where there was a trickle of other pipits and wagtails but a surprisingly poor passage of hirundines. After several days worth of pleasingly decent numbers of common migrants the arrival of brisk westerlies was unwelcome and unproductive. 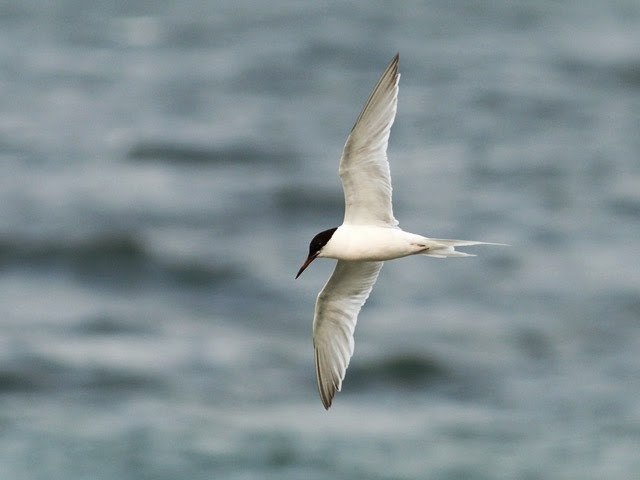 That said, there were was an unexpected new arrival in the form of a Roseate Tern lingering for a while in Chesil Cove; a new Yellow-browed Warbler at Pennsylvania Castle was maybe not so noteworthy these days, whilst the Black Guillemot off Portland Castle looks like it's heading towards becoming a reliable list-padder for the next few months. Among the less frequent migrants there was an excellent count of 24 White Wagtails along East Cliffs at the Bill, but the less said about routine fare the better, with most species present in very reduced numbers. A lone Delicate at the Obs was the only worthwhile overnight capture in the moth-traps. In lovely quiet conditions with plenty of migrants on offer it was disappointing that there were no additions to a rarity tally that consisted of just the lingering Wryneck at the Bill and the Black Guillemot in Portland Harbour. 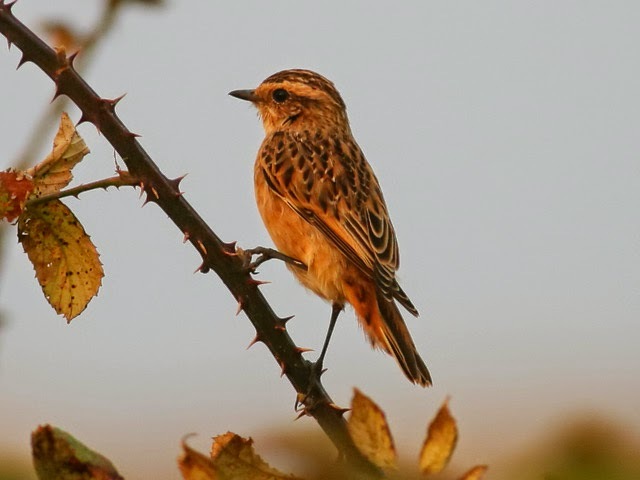 The Bill area came up with a busy mix on the ground and overhead that included 800 Meadow Pipits, 300 alba wagtails, 100 Chiffchaffs, 60 Blackcaps, 25 Stonechats and another as yet unquantified passage of hirundines; amongst the miscellany of lesser numbers there were signs of late autumn finch passage getting going, with Linnets building up on the ground and 5 Siskins and 2 Chaffinches overhead, whilst the fourth Great Spotted Woodpecker of the autumn was also trapped and ringed. Variety elsewhere included 2 Snipe over the centre of the island and 2 Kingfishers and singles of Wigeon and Golden Plover at Portland Harbour. The sea remained quiet, with 36 Common Scoter, 2 Brent Geese and a Balearic Shearwater the best off the Bill. Apart from a thin scatter of Clouded Yellows everywhere immigrant lepidoptera weren't conspicuous, with next of nothing of note attracted to the moth-traps. With no great overnight change in the weather there was something of a re-run of yesterday but with fewer new arrivals. A crack of dawn Yellow-browed Warbler at Culverwell didn't linger, whilst a Wryneck nearby was thought most likely to be the weekend individual relocating; the Black Guillemot also remained in Portland Harbour to provide a bit of unseasonable action there. On the ground the common migrant tally dropped to maybe a third of yesterday's total although there was still plenty about, with the 500 Meadow Pipits, 150 Chiffchaffs and 100 Blackcaps at the Bill ensuring that both the fields and scrub there were busy; there were few surprises amongst the rest of the grounded migrants, with a lone Firecrest at Avalanche Road and another interesting-looking Lesser Whitethroat trapped and ringed at the Obs about the best on offer. Visible passage continued apace, with hirundines and Meadow Pipits making up the vast majority of the totals at the Bill, where 3 Merlins, a Hobby and a Golden Plover were the pick of the variety overhead. Odds and ends through on the sea at the Bill included 40 Common Scoter, a Great Crested Grebe and a Brent Goose. An unfavourable wind direction and further drop in the overnight temperature knocked back numbers in the moth-traps, with singles of Convolvulus Hawk-moth at the Obs and Delicate at Sweethill the best of a limited array of immigrants. 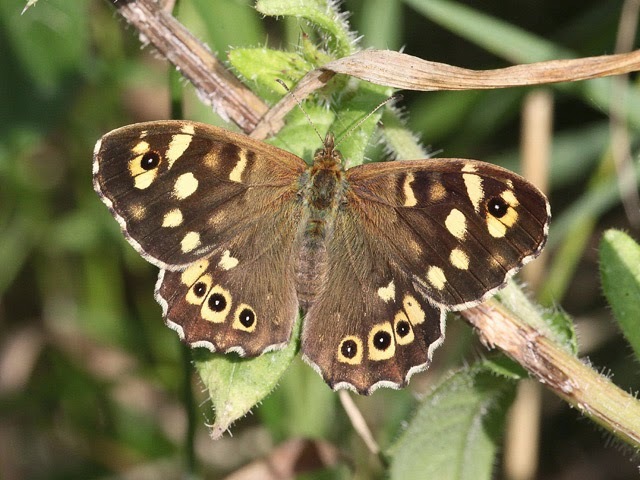 The beginnings of a change in the weather, as well as it now getting into the New Moon period, saw a big improvement in migrant numbers today. 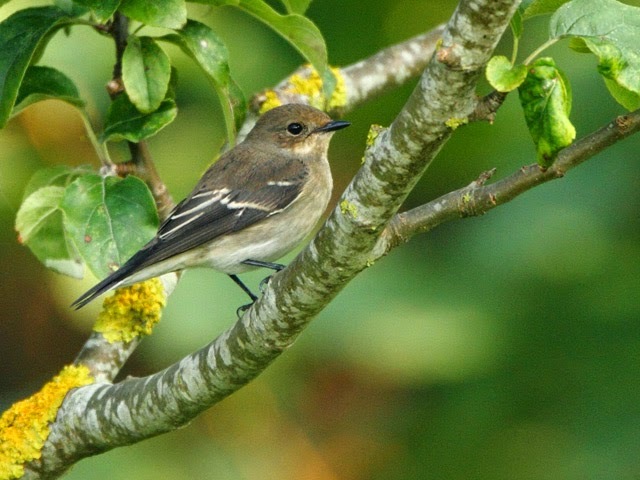 The humid and at times quite murky conditions of recent days were replaced overnight by fresher, clear conditions and it was quickly apparent that that there'd been a decent drop of birds at the Bill, where 400 Chiffchaffs, 150 Blackcaps and 80 Wheatears made up the bulk of the numbers; the varied back-up cast included the first 2 Yellow-browed Warblers of the season, a Ring Ouzel, yesterday's Wryneck lingering on and a light scatter of most of the other expected late September migrants. Visible passage was also very conspicuous, with more than 2000 Meadow Pipits prominent amongst the continual stream of hirundines, wagtails and pipits heading through into the brisk north-easterly. 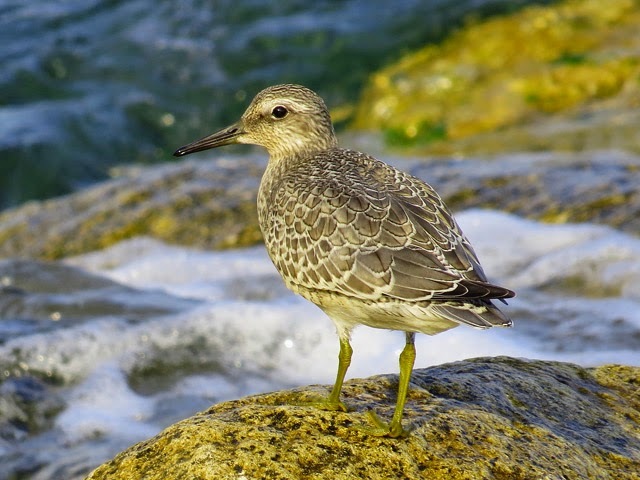 Other island areas were well searched, with a Turtle Dove at Perryfields, the Black Guillemot still in Portland Harbour and the 2 Little Stints at Ferrybridge of note amongst an otherwise more of the same tally. Serious seawatching was possible for the first time for a few days but the reward amounted to little more than a passing Great Skua off the Bill. Despite it getting distinctly cool overnight there was a slightly improved showing of routine immigrants in the moth-traps, with a Hummingbird Hawk-moth and a Delicate at the Obs and another Delicate at Sweethill being the best of the scarcities. 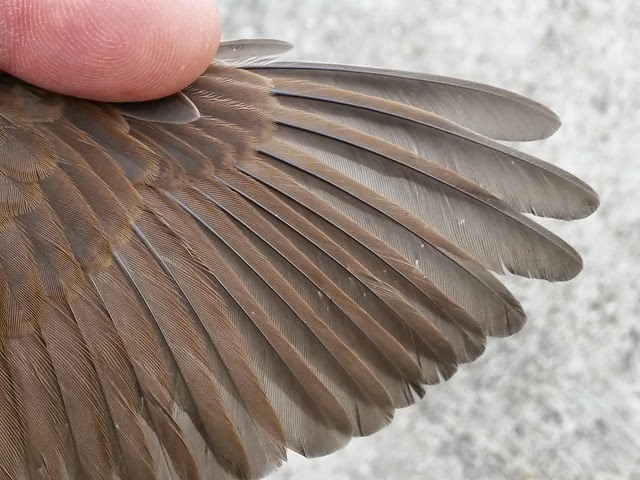 We don't doubt that eventually our day will come, but for the time being there's many a UK bird observatory doing an awful lot better than Portland! Our contribution to the burgeoning list of rarities filling the country could hardly have been more insignificant: a solitary Wryneck new in at the Bill being the sum total; at a more local level interest came in the form of a Black Guillemot (re)appearing in Portland Harbour, 2 Little Stints still at Ferrybridge, a Great Spotted Woodpecker at Pennsylvania Castle, an Osprey heading off south over the Bill and single Firecrests at the Bill and Broadcroft. A small arrival of Chiffchaffs - numbering maybe 100 over the island as a whole - was of note on the ground, where Meadow Pipits were liberally scattered - upwards of 1000 - everywhere, whilst overhead hirundines numbered well into the umpteen thousands but were impossible to quantify in full given the limited visibility in the murky, very humid conditions. 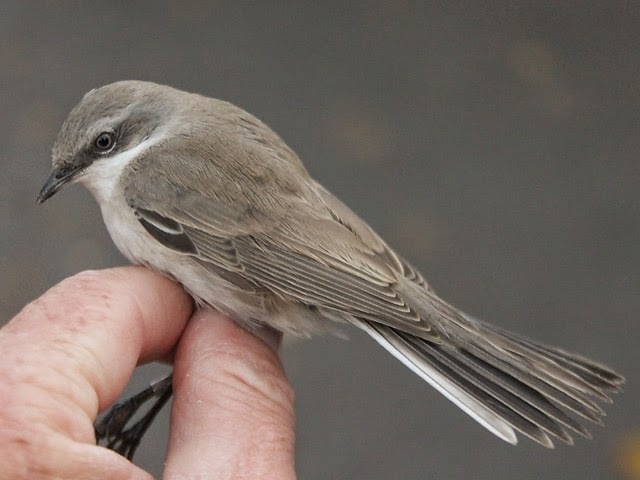 The day's totals of some routine migrants, whilst hardly constituting a fall, showed a slight improvement on recent days and included the likes of 9 Goldcrests and 8 Spotted Flycatchers at the Bill. 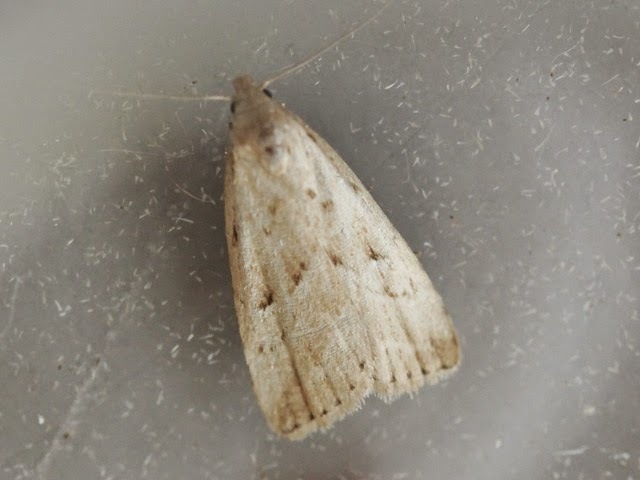 Moth immigration remained at a low ebb, with singles of Olive-tree Pearl at Sweethill and European Corn-borer at the Obs the best of offer from overnight trapping. We might be into the last few days of 'official' summer but you'd never believe it with the humidity sparking off thunderstorms in the Channel and the temperature up around 22°C on each of the last three afternoons; sadly, the quality of the birding also had a distinctly summery feel, with precious few of the migrants we ought to be recording deigning to make landfall again today. 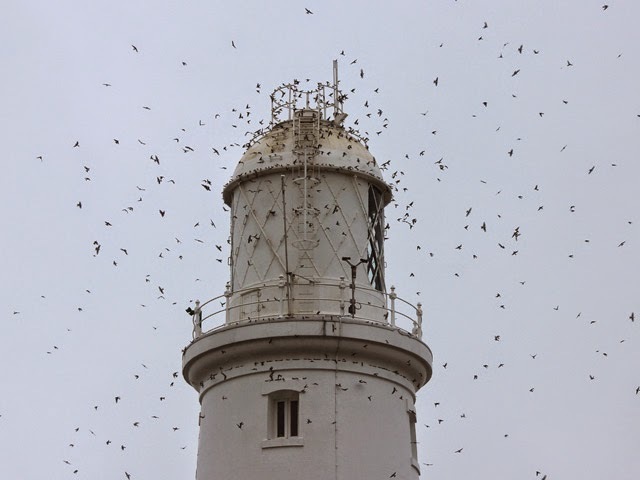 Visible passage stole the show over the north of the island at least, where one observer described the sky blackened with hirundines at one stage during morning; a sample 45 minute count nearby came up with totals that included 2300 Swallows, 800 House Martins and 425 Meadow Pipits. 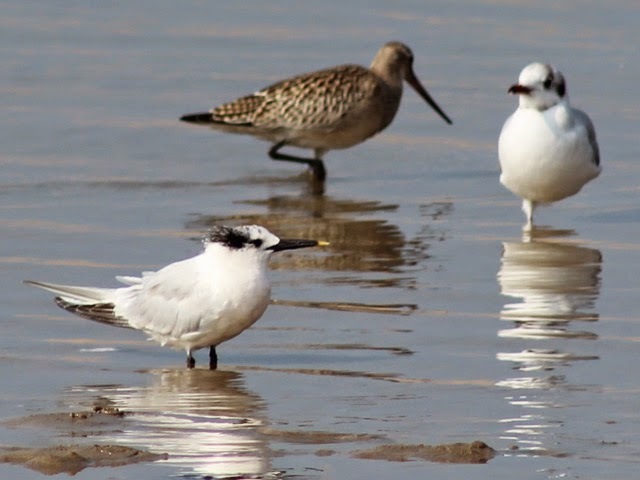 Events on the ground were far from matching this spectacle, with just the merest smattering of routine fare everywhere, and singles of Ruff, Little Stint and Yellow-legged Gull at Ferrybridge the only slightly out of the ordinary sightings. Three Clouded Yellows at the Bill were the first recorded there for a few days. 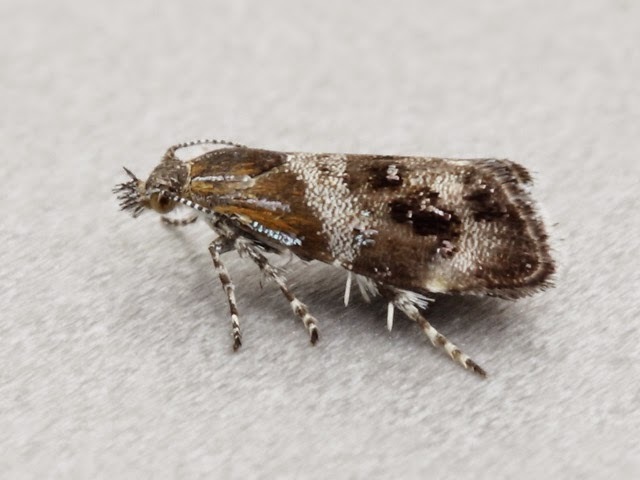 There was considerable expectation for the moth-traps but in the event immigrants hardly featured, with singles of European Corn-borer at the Obs and the Grove, a Horse Chestnut at Sweethill and a Spindle Knot-horn Nephopterix angustella at Weston pretty much the best of a bad job. 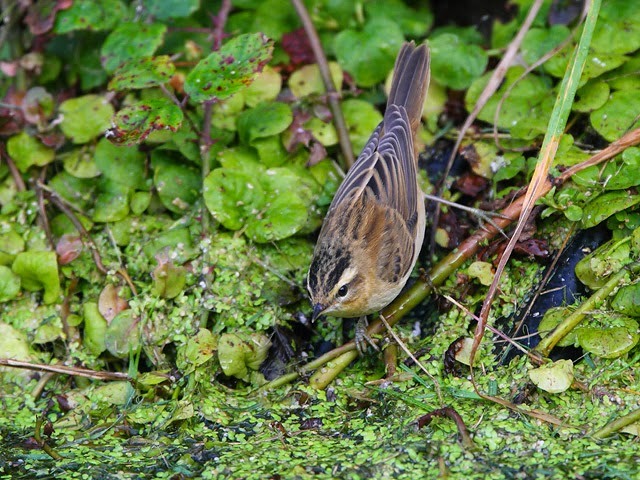 The unseasonably warm weather of recent days continued and, with a few exceptions, migrants remained in short supply. On the ground chats featured more conspicuously than anything else, with 100 Wheatears, 50 Robins, 15 Whinchats and 7 Stonechats at the Bill alone; warblers and crests were very poorly represented, with 4 Goldcrests and a Firecrest in the Mermaid/Pennsylvania Castle area about the best concentration on offer anywhere. Visible passage was rather lighter as yesterday but did include the first Siskin of the season over Blacknor. Oddities were few and far between: the Nightingale was still in residence at the Obs Quarry, a Short-eared Owl was again at the Bill, the Hooded Crow at the Grove was looked for for the first time this week and found to still be present and 3 Little Stints, 2 Knot and a Teal were at Ferrybridge. 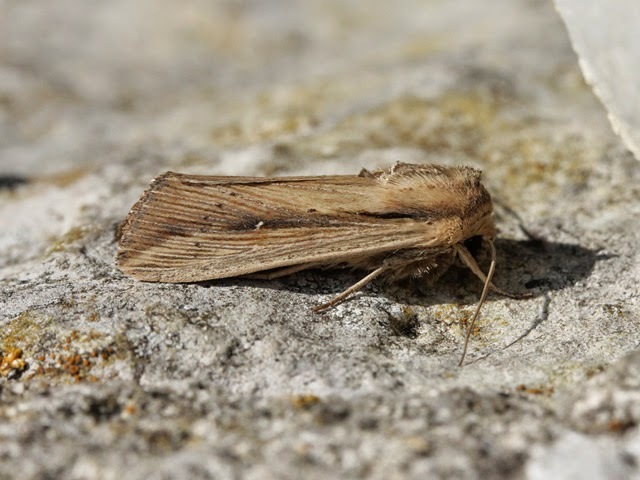 Immigrant moths included singles of Convolvulus Hawk-moth and Delicate at the Obs, 2 Oak Hook-tips and a European Corn-borer at Sweethill and another European Corn-borer at the Grove. 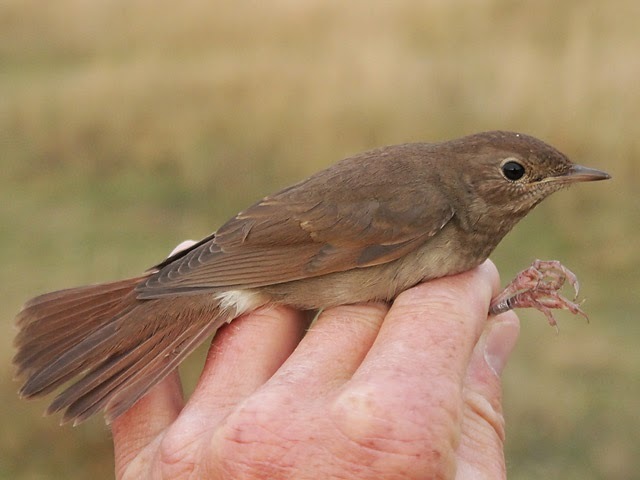 A trickle-down of rarities from points eastwards has been increasingly anticipated and duly came to pass today with the discoveries of a Tawny Pipit and a Barred Warbler at the Bill, although sadly, since the former was not really a performer and the latter was only seen in flight by one fortunate observer, the excitement passed most observers by; a Nightingale was also a worthy addition to the tally at the Bill even if as seems likely it was a reappearing lingerer rather than a new arrival. Unfortunately the back-up cast to the oddities was lacking - at least on the ground - both numbers and variety: 3 Little Stints and a Yellow-legged Gull at Ferrybridge and singles of Short-eared Owl, Grasshopper Warbler and Pied Flycatcher at the Bill were all of interest, but few if any common migrants were represented in anything other than the thinnest of spreads. Overhead it was a different story, with the heaviest hirundine passage of the autumn to date a feature everywhere; sample counts of the mixed passage of all three common species were getting up to around 5000/hour at times, whilst the presence in the mix of plenty of Meadow Pipits and at least 2 Hobbys added still further to the spectacle. Yesterday's immigrant moth interest wasn't sustained, with the strength of the wind leading to very reduced overnight catches in all the traps. 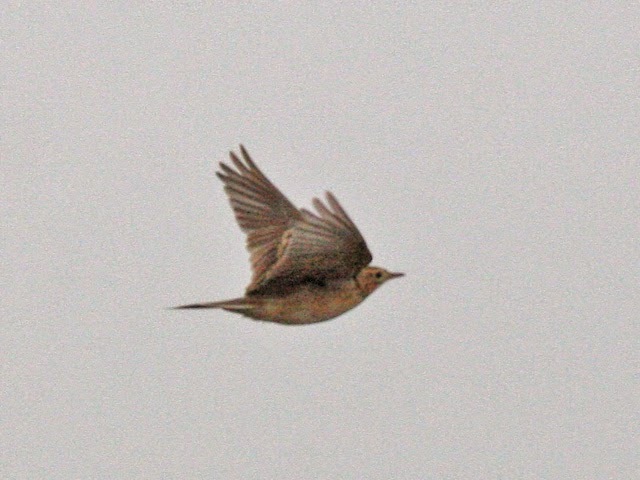 ...although captioned here as Tawny Pipit, some aspects of the bird's apparent appearance in these snatched record-shots has led the observer to express his doubts as to the firmness of the ID; since the bird wasn't seen on the ground, the only additional details that can be added are that the few calls heard sounded compatible with those of Tawny Pipit. After a night when sampling with a sound recorder revealed there was strong passage of passerines overhead (there probably always is at this time of year, but to actually hear the faint calls of things like Tree Pipits high overhead in the early hours was quite a revelation - thanks to Nick Hopper for instigating this project) it was a considerable disappointment to find that the wind was fairly whipping along the Channel again at dawn. Despite the unhelpful conditions it didn't take long to discover that really very little had grounded, with even the commonest migrants only thinly spread at the Bill; Wheatear and Blackcap managed totals there of 40 and 20 respectively, but with few other even double figure totals it was left to singles of Short-eared Owl and Grasshopper Warbler to provide the best of the interest. Visible passage of hirundines, pipits and wagtails was a lot stronger, and included a sample total of 618 Meadow Pipits through in 30 minutes during the morning; apart from the numbers, interest overhead also came in the form of a Marsh Harrier over Weston, and 18 Cormorants and a Hobby over the Bill. The day's only other reports were of 2 each of Little Stint, Sanderling and Knot amongst the waders at Ferrybridge. A Marsh Oblique-barred - a new species for the island list - caught at Reap Lane was by far the highlight from overnight mothing; immigrants/wanderers at the Obs included 2 each of Rusty-dot Pearl and Rush Veneer, and singles of Diamond-back Moth, Horse Chestnut, Pearly Underwing, Delicate, Dark Spectacle and Silver Y; elsewhere, singles of Oak Hook-tip and Delicate were the best on offer at the Grove. ...a very unexpected addition to the island moth list from John Lucas' garden trap - we'll try again for a better photo but it was a pretty miserable looking specimen and we daren't let it out of the pot as it was extremely skittish and constantly scuttled about like a diminutive mouse! Despite its tiny size, it seems this species has some propensity to wander away from its usual haunts in acid bogs and mosses with, for example, a previous coastal Dorset record at Durlston Head. 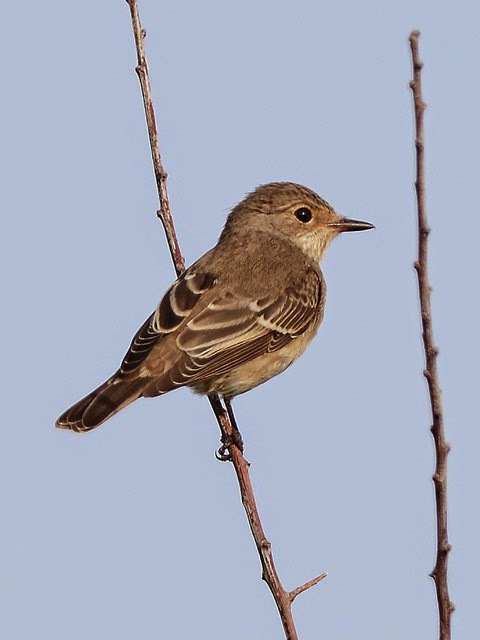 A gradual decline in the strength of the prevailing easterly was very welcome and there were signs of a little bit of an input of quality into the day's migrant proceedings. In view of events on the East Coast there had been some expectation of Honey Buzzards putting in an appearance, and the first duly appeared over the centre of the island during the morning; another fly-over Ortolan Bunting and the third Great Spotted Woodpecker of recent days were the best on offer at the Bill, whilst 2 Little Stints at Ferrybridge and a Ring Ouzel at Penn's Weare topped the list of less frequent migrants elsewhere. Passage overhead - still dominated by Swallows and Meadow Pipits, but with House Martins beginning to feature more strongly - continued apace, whilst on the ground it was Robins that were dominant, with getting on for 100 at the Bill alone. Immigrant moths caught overnight at the Obs included 6 Diamond-back Moth, 2 Rusty-dot Pearl and singles of Oak Hook-tip, Convolvulus Hawk and Silver Y. 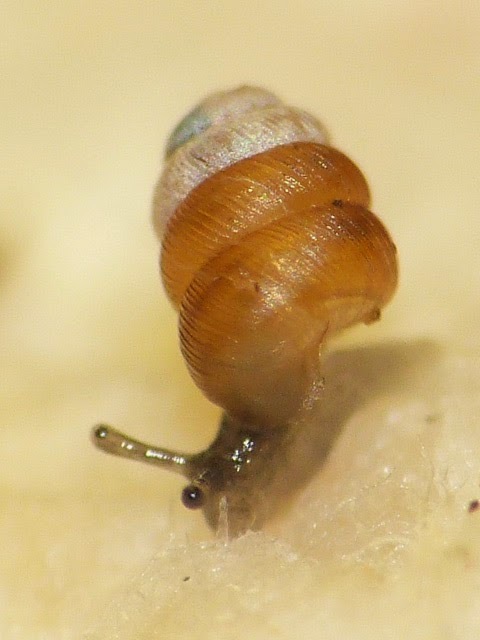 ...the tiny callicratis is found in only 15 10km squares along the South Coast between East Devon and the Isle of Wight, with Ferrybridge perhaps the best known site for it. Next time you go trudging over the grass there en route to do a seawatch off Chesil spare a thought for the likes of callicratis or the even rarer (its only UK site) beetle Omophlus betulae - crippling rares that are literally under your feet! Perhaps we're getting tiresome with the frequency with which we're wishing for more, but today was another day of easterlies that really didn't come up with the goods. 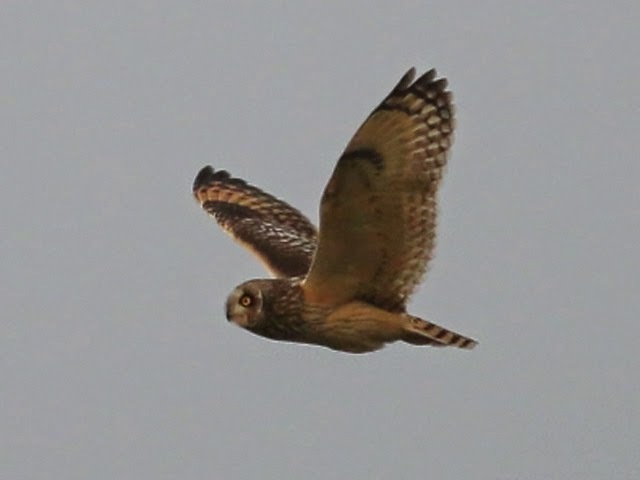 Singles of Marsh Harrier over Southwell and Turtle Dove (the first of the autumn) and Short-eared Owl at the Bill were nice but certainly falling well short in the quality stakes of what there quite easily could or ought to have been to keep the weekend visitors happy. Overhead passage again accounted for the bulk of the numbers, with Swallows and Meadow Pipits well into the low hundreds, but on the ground it was again a case of variety rather than quantity: at the Bill, Wheatear chipped in with the highest count but that was only a rather modest 50; most other species struggled to get beyond double figures, whilst 2 Grasshopper Warblers, a Merlin and an early first Reed Bunting of the autumn were the best of the less frequent migrants. Another single Balearic Shearwater passed through off the Bill. Singles of Convolvulus Hawk-moth and Dark Spectacle were the only immigrants that made it into the Obs garden moth-traps. 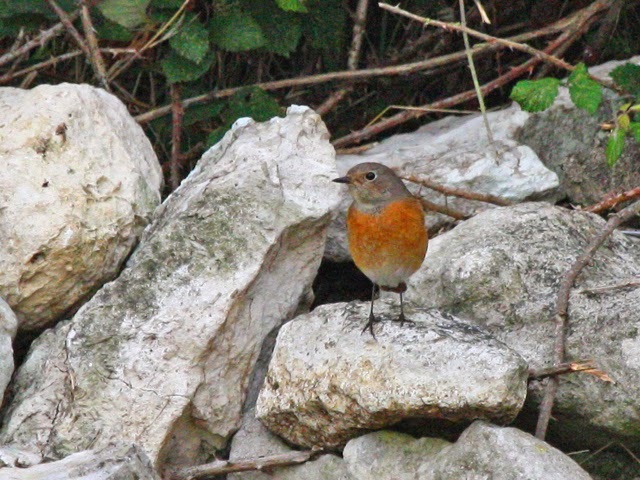 Despite there being next to no change in the weather there were hints of a few happenings on the migrant front today. By and large, grounded arrivals weren't at all uniformly spread or plentiful but pockets of interest included the likes of 16 Whinchats in one field at the Bill, 3 Lesser Whitethroats at Coombefield Quarry (with another 2 at the Bill) and 22 Knot that dropped into Ferrybridge (together with another 6 at the Bill). 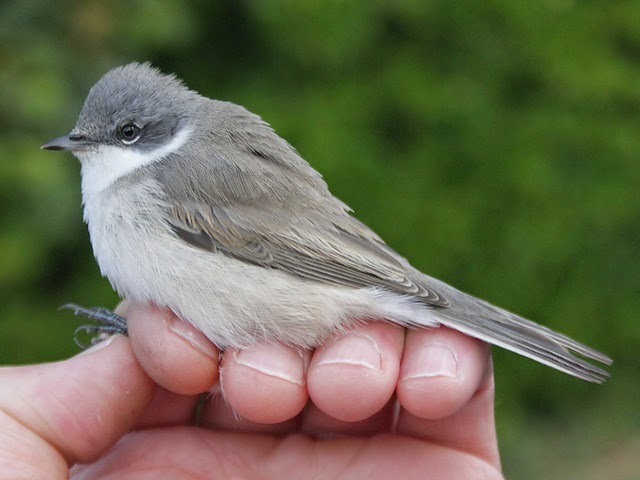 As in the last few days, most of the other expected migrants were represented but there were few if any really worthwhile totals amongst them and a Nightingale still at the Obs Quarry provided the only quality; elsewhere the autumn's first Firecrest was at Weston. 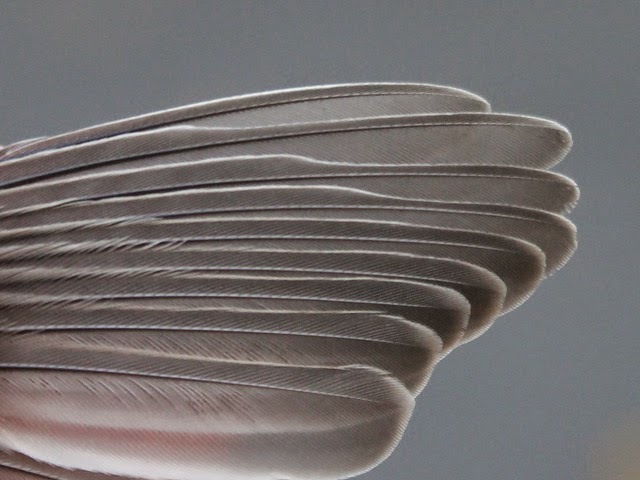 Overhead passage again took place over a broad front and was therefore tricky to quantify, but Swallows were certainly well into four figures at the Bill, where another passing Hobby was of further note. In the light of yesterday's events not too far away the sea got plenty of attention, with 14 Balearic Shearwaters, singles of Dark-bellied Brent Goose - another autumn first - Great Skua, Arctic Skua, Little Gull the pick of the sightings from the Bill. Singles of Oak Hook-tip and Delicate were the best of an otherwise very limited array of immigrants/wanderers in the Obs garden moth-traps. With no end in sight to the fine, warm conditions resulting from the prevailing easterlies today was another more of the same day. 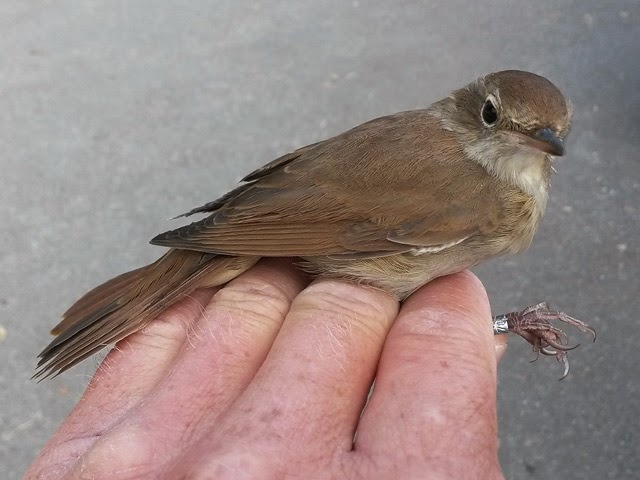 Although indications from the Obs mist-nets suggested that still fewer migrants were making landfall - the daily ringing totals there have declined steadily from 120 last Friday to just 10 today - there was evidence from the fieldworkers that across the island as a whole numbers may have crept up a little today. A pretty well full suite of mid-September migrants made the list but it was only really Blackcaps and Robins that featured in any quantity on the ground, with heading towards 100 of the former and 50 of the latter scattered about the centre and south of the island; overhead passage was steady rather than spectacular with the usual suspects - mainly Meadow Pipits and hirundines - dominating. Quality was hard to come by, with 11 White Wagtails, 2 Nightingales (both at the Obs Quarry) and singles of Hobby and Merlin providing the best value at the Bill, and a lone Little Stint again featuring at Ferrybridge. 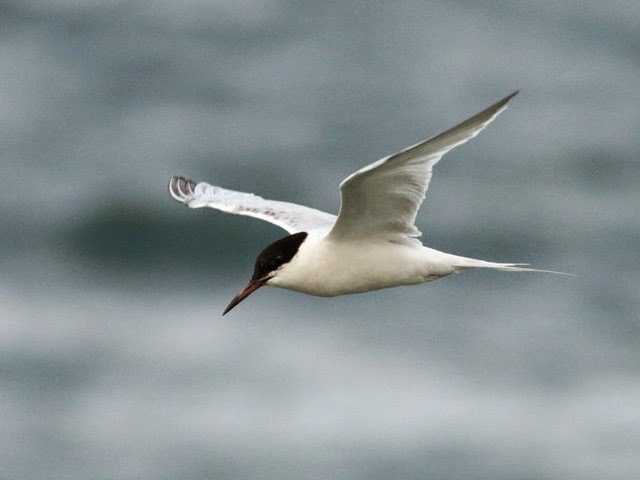 The seawatchers were left scratching their heads after dipping out on virtually all of a major movement of birds on the other side of Lyme Bay; their contribution to the day's proceedings amounted to no more than 13 Sandwich Terns, 8 Common Scoter and 3 Balearic Shearwaters. 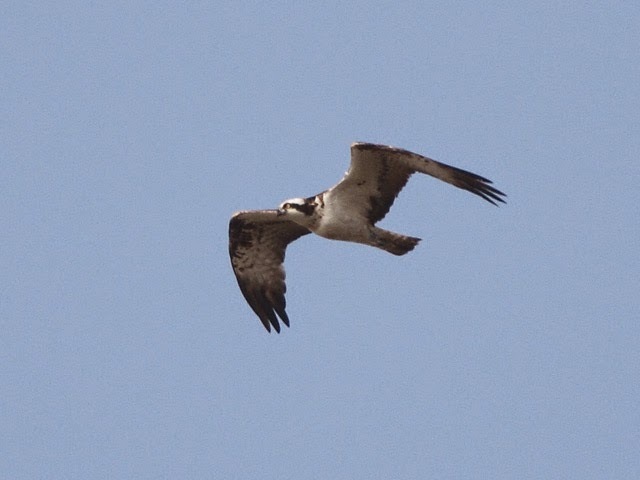 Also some snippets of late news received this week: an Osprey over Top Fields on 5th September, an Ortolan Bunting at New Ground on 7th September and a Nightjar at Park Road, Easton, on 8th September. A dispersing Horse Chestnut provided the night's only interest in the Obs garden moth-traps. Another diminished return on the migrant front today although the steady build-up of cloud cover as the day went on gave hope that there may be more in the offing in the coming days. 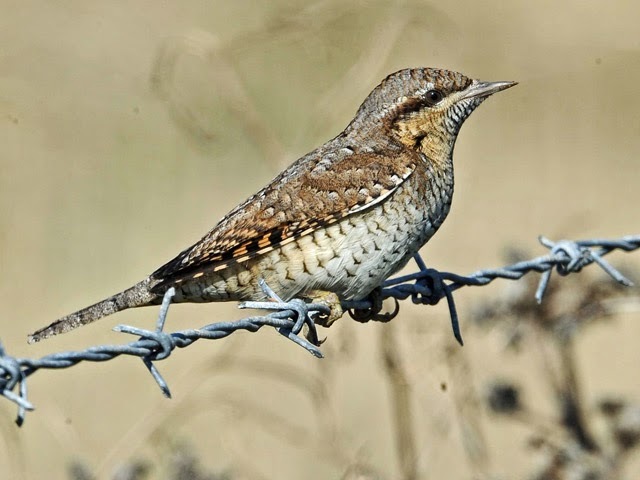 The Barleycrates Lane Wryneck continued to entertain a steady stream of visitors, but the day's only other quality was provided by overflying singles of Marsh Harrier and Lapland Bunting at the Bill. 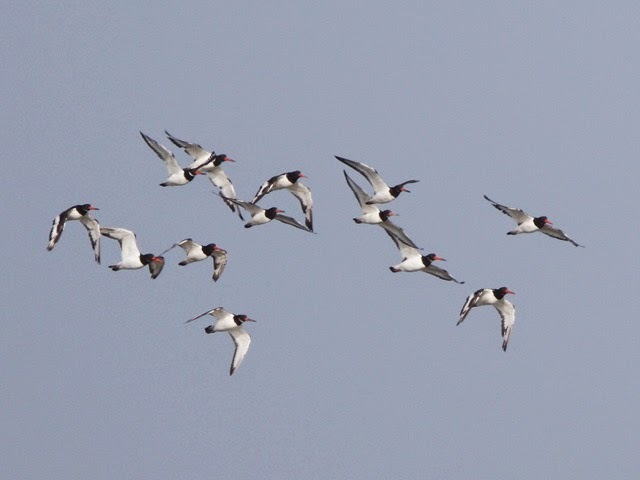 Overhead passage accounted for the best part of the commoner migrant numbers, with a steady broad-front passage of hirundines heading through into the easterly breeze for several hours after dawn - the Swallow total was well into four figures, whilst Sand Martins also continued to feature quite strongly and reached into the low hundreds. Totals on the ground were pretty dreadful, with few species even getting into double figures, but yesterday's minor resurgence on the sea continued with 10 Balearic Shearwaters and a Bar-tailed Godwit through off the Bill. 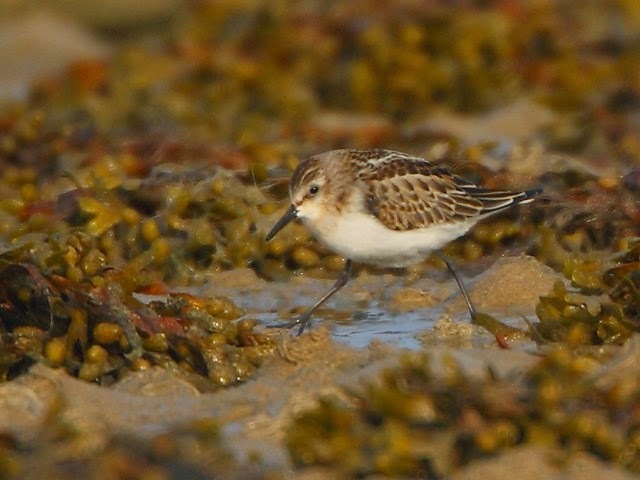 Finally, waders at Ferrybridge included 130 Dunlin, a Sanderling and a Little Stint. The less said about the moths the better, with nothing more than a handful of routine immigrants caught overnight. A reminder that the next In Focus field event at the Obs takes place between 10am and 4pm this Saturday, 13th September. The law of ornithological - and for that matter entomological - diminishing returns more or less dictates that it'll be getting quieter by the day, and so it came to pass, with today's conspicuously freshened south-easterly coming up with few tangible rewards beyond the continuing presence of a few long-stayers: the Wryneck at Barleycrates Lane, the Nightingale at the Obs and an Icterine Warbler there that on turning up in a mist-net was revealed to be the bird first ringed last week (whether or not it was the individual present over the last couple of days remains to be established). 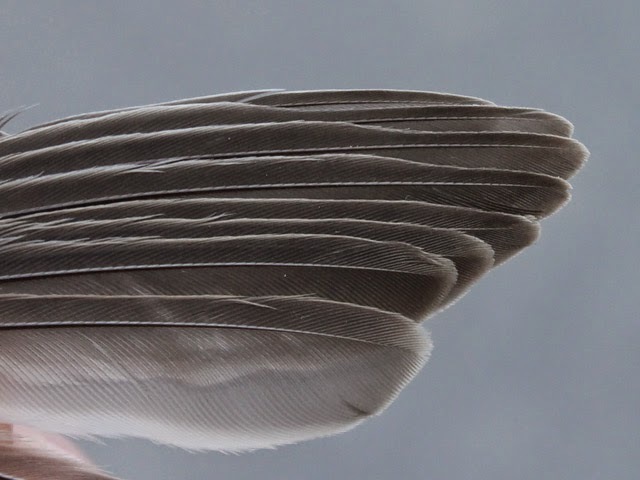 Routine migrants were in relatively short supply overhead as well as being sufficiently thinly spread on the ground as to getting individual mentions on the day-sheet, with nothing more noteworthy than 5 White Wagtails at the Bill making the tally. A minor flurry of interest on the sea included 2 Great Skuas, 2 Arctic Skuas and a Sooty Shearwater through off the Bill. A Spindle Knot-horn Nephopterix angustella was the sole morsel of interest amongst the handful of common immigrant moths caught overnight at the Obs. Is it getting to the stage where we've had too much of a good thing and probably need a stir-up in the weather? Easterlies have been well-established for a week now and have certainly produced a selection of oddities as well as a considerable upsurge in migrant numbers (more birds have been ringed at the Obs so far this month than in the whole of August) but today had that disheartening quiet feel about it that suggested a change might be welcome. Bearing in mind that it's also the full moon period - it's so clear and bright overnight that's it's hard to imagine why anything would have bothered to drop in - it was a surprise that were actually a couple of spots where grounded migrants were relatively numerous, with more than 50 Blackcaps at both Coombefield Quarry and Tilleycombe; interest on the ground was otherwise scant: the Wryneck at Barleycrates Lane, the Icterine Warbler at the Obs and the Nightingale at the Obs Quarry were all still in situ, singles of Short-eared Owl at the Bill and Firecrest at Avalanche Road provided further interest, but it was otherwise none too exciting on the ground. After some early promise overhead, when hirundines, pipits and wagtails looked to be getting going in quantity at the Bill, everything fizzled out rather tamely with no more than single Merlins over the Bill and Reap Lane, and a late Swift over the Bill to show by way of quality. Conditions were again not at all favourable for overnight moth-trapping, with a single Cosmopolitan at the Obs constituting the immigrant highlight. 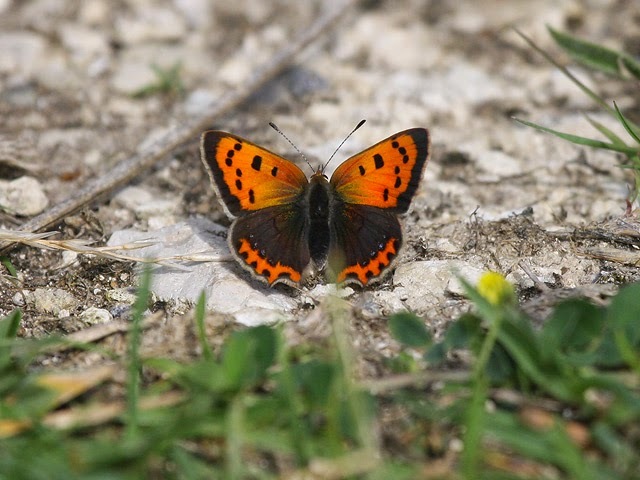 In more gloriously warm and sunny conditions migrant interest was subtly different to yesterday with a lower key showing on the ground being more than compensated for by increased numbers overhead. 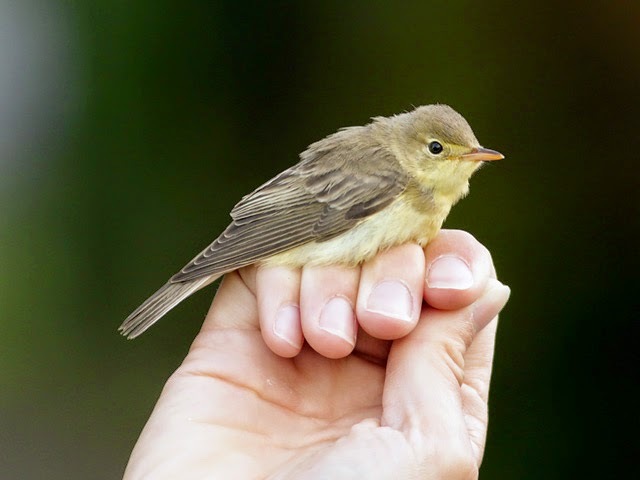 Scarcities featured again, with the Wryneck still at Barleycrates Lane, an rather elusive new Icterine Warbler in the Obs garden, Ospreys over Ferrybridge and the Bill, one or two Nightingales in the Obs garden/Obs Quarry area and 3 Short-eared Owls at the Bill. Pretty well all the expected early September common migrants made the log, but with clear skies and in - at least early in the morning - a brisker breeze than of late it was visible passage that accounted for all the decent counts, that included the likes of 1000 Swallows (including in their midst a leucistic individual and plenty of Sand Martins), 400 Meadow Pipits, 100 Yellow Wagtails and 20 Tree Pipits over the Bill and 40 Oystercatchers over Ferrybridge; on the ground there were just low tens of Wheatears, Whitethroats, Chiffchaffs and Willow Warblers, and no more than single figure totals of most other routine fare. Single Manx and Balearic Shearwaters passed through off the Bill. On a night of clear skies and a huge moon little had been expected of the moth-traps, so in the immigrant line singles of Convolvulus Hawk-moth at the Obs and Vagrant Twitcher (...don't you just love that vernacular name!) Tebenna micalis at Sweethill were welcome surprises. 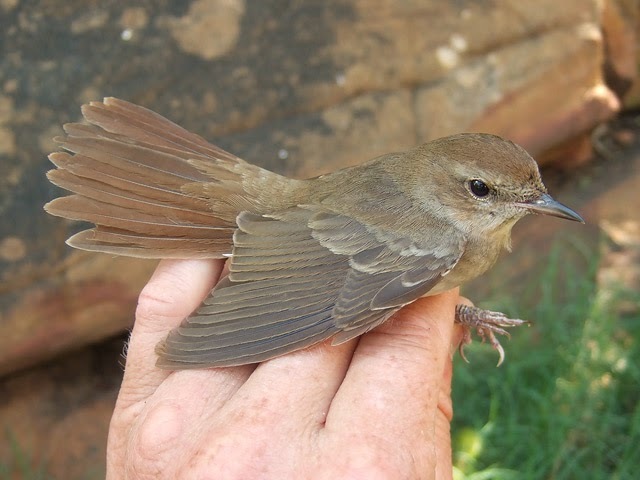 ...this is an africana/hafizi (presumably on plumage closest to the central Asian breeder, hafizi) Nightingale that we were lucky enough to have a good look at in Kenya a couple of years ago - there'll be no mistaking one of these when it pops up in one of our nets later in the autumn. Despite there being a distinctly autumnal feel to the cool, very dewy dawn it soon warmed right up and in unbroken sunshine felt a lot more like high summer than early September. Dawn also revealed a real autumnal feel to the birding, with migrants aplenty everywhere, although under such clear skies many had filtered away after a few hours. After a gap of a couple of weeks since this autumn's first Wryneck another one or two at Suckthumb Quarry/Barleycrates Lane were welcome as well as really overdue given the now well-established easterly weather; one or more very mobile Ortolan Buntings also made the list at the Bill, but oddities otherwise didn't get better than singles of Little Ringed Plover, Knot and Great Spotted Woodpecker at the Bill, the autumn's first Ring Ouzel at Suckthumb Quarry and 2 Ruff and a Little Stint at Ferrybridge. 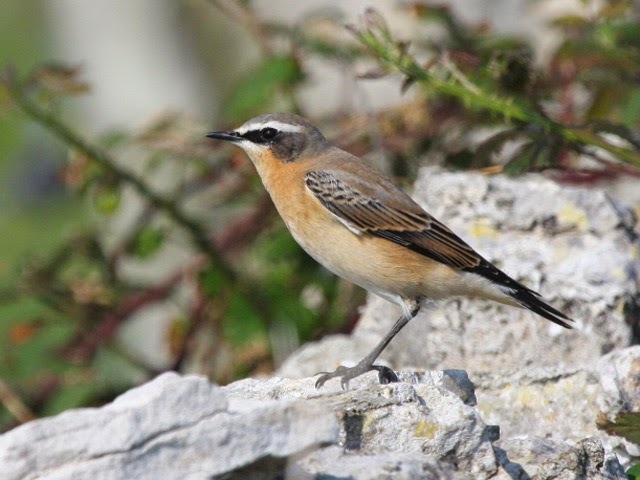 Although hirundines were constantly on the move overhead and patches of cover were busy with the likes of Blackcaps, phylloscs and flycatchers, it was really the fields that provided the best of the day's migration watching, with the Bill area in particular jumping with totals that included 400 Wheatears, 250 Meadow Pipits, 150 Yellow Wagtails, 60 Whinchats and 25 Tree Pipits; pretty well everything else that might have been expected chipped in with lower totals. 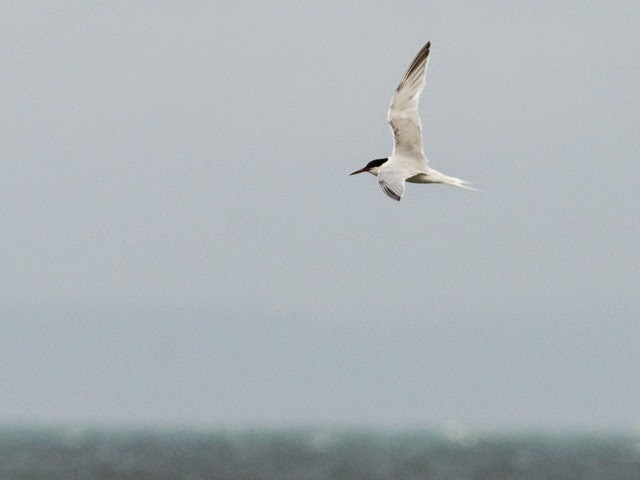 The sea again received little attention, with 2 passing Balearic Shearwaters the only birds of note off the Bill. Moth numbers took a tumble on a clear, moonlit night; none of the commoner immigrants even managed a double figure total at the Obs, whilst the only scarcities logged were singles of Vestal at the Obs and Olive-tree Pearl at the Grove.